Creating an effective board and management team. It is very important to have a Board of Directors that can bring additional capacity and political capital to the organization, because land banks require multiple areas of expertise and deep connections with other organizations within a community to be successful. Particularly helpful areas of expertise include real estate, legal, fundraising, housing development, and information technology. It is also critical to have administrative and board leadership that are able to work well together to accomplish organizational goals. Developing a meaningful business plan. There are many moving parts associated with the functions of a land bank. Therefore, it is necessary to have a good business plan, with a clear mission, vision, and goals, well developed strategies for meeting goals, and well-defined roles and responsibilities. Managing relationships and politics. By its nature as a quasigovernmental organization, a land bank is a political entity. In our work with land banks, I have often found that it is easy to get bogged down in the minutia of new initiatives in order to keep major stakeholders such as the mayor or funders happy. Strong leadership within the organization is necessary to steer the ship above the fray, by keeping the big picture mission and goals out in front of these stakeholders. It is often a delicate balance to maintain momentum without ignoring each new day’s political firestorm. Clear, concise, and frequent communication about what is needed to meet schedules and goals will help you to better maneuver through these rough waters. It is also important to build capacity to undertake the many tasks required. This is needed not only internally, but externally within your partners. We have found that capacity must be nurtured to grow. This is particularly true for non-profit organizations. Where government agencies and land banks have, over time, held frequent training, provided program funding and seed money for development, and provided clear policies and procedures, we have seen considerable capacity within non-profit partners. Where these things have been neglected, little partnership capacity is developed. Funding. You will need diverse types of funding to meet program goals. Maintenance, demolition, redevelopment, and staffing are just a few of the areas that will require significant capital. Again, the development of strong relationships with city departments, foundations, financial institutions, and other funders is key to success. It will also be necessary to do a good job of telling your story, to think creatively about ways to fund initiatives, and to find ways to collaborate in the accomplishment of goals. Managing information. We provided technical assistance to the Detroit Land Bank Authority when they were growing from a staff of two to over 70 and were taking on about 60,000 additional properties. With this kind of growth, it is a struggle just to get basic systems in place, and they needed to hit the ground running. It was necessary to quickly find ways to manage finances, develop a database to track and manage properties, create and manage filing systems, and develop programs to accomplish basic goals. Having good, integrated systems for all of these functions can do much to make your life easier. vandalism, fires, and many other problems. It is important to have good board-up systems in place that will not be easily broken into, and will present the house in a way that detracts as little from the quality of the neighborhood as possible. There are, for example, systems that make the houses look lived in. Keeping the grass cut and the trash picked up. If your goal is to improve the neighborhood, then it will be necessary to maintain your property in a way that supports that goal. Regular lawn maintenance and trash pick-up will be a necessity. It will mean finding a way to fund both this and board up over time. Being prepared when issues arise. It will be necessary to have nearly constant eyes on each house, and to have thought in advance about how you will handle fires, unsafe structures, unwanted inhabitants, and other issues that will likely arise. disagreements with a developer or contractor. You may also need to consider the regulatory requirements of any funding associated with each property. As you take on tax foreclosed properties, you will very likely come across some of those properties that are occupied. If you are taking on large numbers of units, there may be many of these that are occupied. The occupants may be a former owner on which the property was foreclosed, tenants of a previous owner, or squatters. Here are a few suggestions for addressing this issue. Recognize the sensitivity of the issue. You do not want tomorrow’s newspaper headlines to read, “Local land bank puts citizens on the street”. Make use of partnerships. You may be able to identify non-profits or other partners that can assist in addressing this issue through the screening of occupants, the provision of financial counseling and credit clean up, the placement of occupants into shelters or other housing, the redevelopment of rental and/or for sale housing, etc. Categorize occupants through investigation and discussion. Occupants may be able to stay in the house as renters, or even legally be turned into homeowners. Others may be eligible to rent or purchase other available housing. Some might need to be relocated into temporary housing, shelters, or evicted. Categorize occupied houses. Place housing into designated tracks based upon their condition, location, and neighborhood plans. Plan for each track. Develop a program with clear and detailed processes, roles and responsibilities, and needed funding to manage each track. Property security. Avoid compounding the problem by keeping the property secure. Demolition. 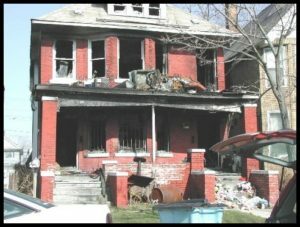 You will need some mechanism to determine which properties should be demolished and which should be rehabbed. Usually demolition program decisions are tied to tools for evaluating the physical condition of the unit and the buildings historical value. Choices about which properties to demolish are typically decided within the context of the overall plan for the neighborhood. Selling or donation of side lots. This is often allowed for neighboring property owners, and you will need clear policies and procedures for how this is accomplished. 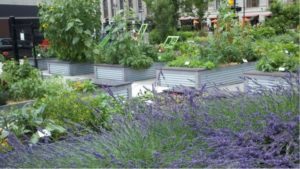 Creating pocket parks and/or urban gardens. The challenge here is who will be responsible for maintenance, who will own the property, how liability issues will be addressed, and how to ensure that the property is taken care of in perpetuity. Selling homes to private buyers wishing to live there. This can be accomplished through direct sales, a physical or on-line auction, or other creative approaches. One challenge is how to bring each house up to code requirements. Typically, a set number of months is given to bring the house up to a given code or standard. Often would-be buyers lack funding and/or skills for rehabilitation. It may also be difficult to find credit worthy buyers with sufficient working capital. Even if you are selling the houses at a nominal fee, the new buyer will be responsible for rehabilitation, ongoing maintenance, lawn care, taxes, etc., and may be unable to meet these obligations, especially without other financing. You do not want to set people up for failure. Your goal is not to have this property returned to the land bank in another foreclosure proceeding. Redeveloping property. Again, your success in accomplishing this may depend on the sources of financing available to developers and upon the capacity and financial strength of your development partners. For example, when we worked with the Baton Rouge Redevelopment Authority, we found that it was necessary to spend considerable time with each developer to assist them in creating workable development plans, to write up adequate agreements, and to identify additional sources of funding to meet program goals. It will also often be necessary to aggregate properties within a neighborhood to make redevelopment at scale possible. As you can see, there are many facets of land banking that require careful, thoughtful planning. Though this article only touches on the surface of these issues, I hope that it provides you with some additional insight on what is needed to successfully deal with the challenges of improving communities through land banking.